One of the key steps in the refining process is the elimination of impurities from crude vegetable oils especially the phosphatides or so-called gums. Degumming process-degumming acid such as phosphoric acid or citric acid. Soap Noodles vegetable origin derived from RBD Palm Oil and RBD Palm Kernel oil and Coconut Oil with required composition blend for soap making. Glycerol Process-Crude glycerol from the hydrolysis of triglycerides can be purified by treatment with activated carbon to remove organic impurities, alkali to remove unreacted glycerol esters, and ion exchange to remove salts. High purity glycerol (> 99.5%) is obtained by multi-step distillation which is called refined glycerine. 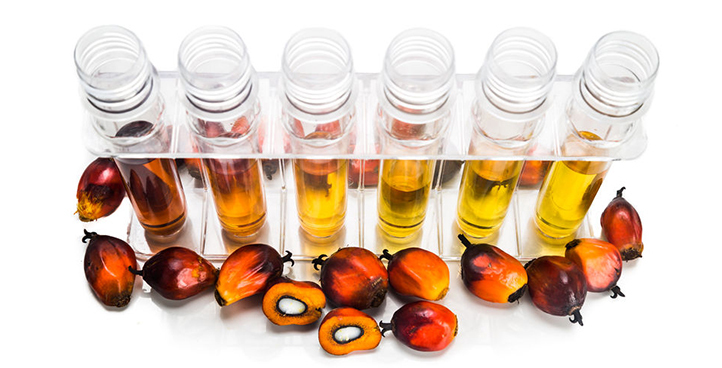 Palm biodiesel is an alternative fuel derived from palm oil and can be used in compression ignition engines, i.e. diesel engines without any modifications. It refers to methyl esters derived from palm oil through a process known as ‘transesterification’. The process involves the use of a catalyst along with methanol to convert oils to biodiesel. Sodium methylate (or sodium methoxide SMO) is the predominant catalyst for the production of biodiesel.